Submitted 3 months 6 days ago by Frog Man. From their manufacturing plant in the Czech Republic, Sellier & Bellot have become an increasingly popular choice among militaries and commercial shooters alike. Sellier and Bellot’s .45 ACP is the perfect fuel for your next 1911 range excursion. These .45s come equipped with a 230-grain FMJ projectile, loaded into Boxer-primed, noncorrosive reloadable brass cases and are capable of a muzzle velocity of 853 FPS. 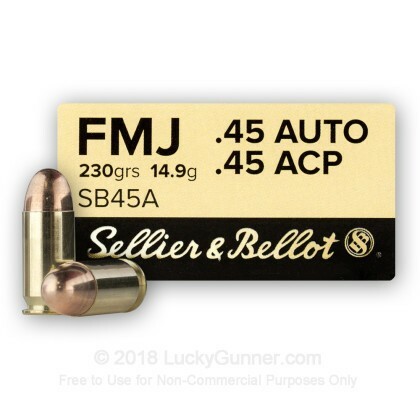 Great for plinking, serious practice and fun days at the range, each case of Sellier and Bellot .45 ACP comes with twenty, 50 round boxes and is a great way to stock up on .45 ACP. Sellier & Bellot since 1825, has been a producer of high-performance ammunition, creating a name associated with reliability and innovation. As one of the oldest manufacturers in the world, they continue to be a top choice of militaries and commercial shooters the world over.